(RT) The death toll in California has risen to 42 and 228 people are still missing as three major wildfires continue to sweep across the state. An estimated 250,000 people have been displaced from their homes. Thirteen more people were confirmed dead from the “Camp Fire” in Paradise, northern California, taking the toll in that area to 42 and making it the deadliest fire in California history. 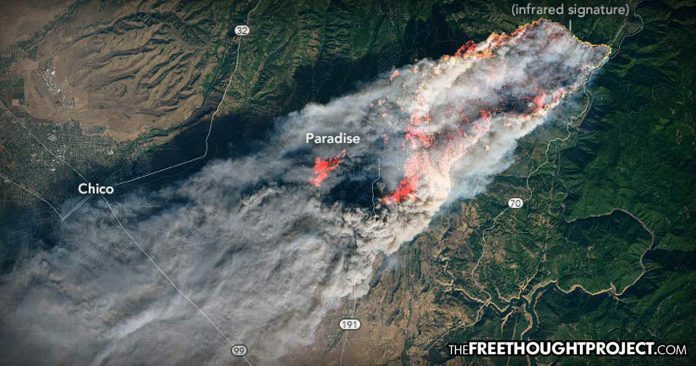 Paradise, some 90 miles (145 km) north of Sacramento, has been completely destroyed by the blaze, with the authorities saying that up to 90 percent of the residents lost their homes. The death toll is expected to rise. An estimated quarter million Californians have been forced to flee their homes to escape the three blazing infernos across the state. Strengthening winds mean the flames are expected to spread even further by Tuesday. So far, the fires have spread to some 400 square miles (1,040 square km) as some 8,000 firefighters are still unable to contain the inferno. California governor Jerry Brown is urging President Donald Trump to declare the situation as a major disaster in order to secure emergency funding. In southern California, the Woolsey Fire claimed two lives as it tore through beach resorts and coastal homes in Malibu, west of Los Angeles. An estimated 370 structures have been destroyed, while another 57,000 are believed to be under threat. With Malibu being home to many of the rich and famous, it’s unsurprising that several celebrities have been affected by the Woolsey blaze. Neil Young, Robin Thicke, Gerard Butler and Miley Cyrus are among those who lost their homes along the coastline. Reality star Kim Kardashian, actress Alyssa Milano, Orlando Bloom, Lady Gaga and director Guillermo del Toro were also among the celebrities forced to pack up and flee their upscale homes in Calabasas and Malibu, with flames licking at their heels. (RT) California is still burning amid the worst wildfire crisis in its history. So far, 42 people have been killed and 228 are missing as the state is reduced to a hellscape. Satellite imagery of the destruction makes for grim viewing. 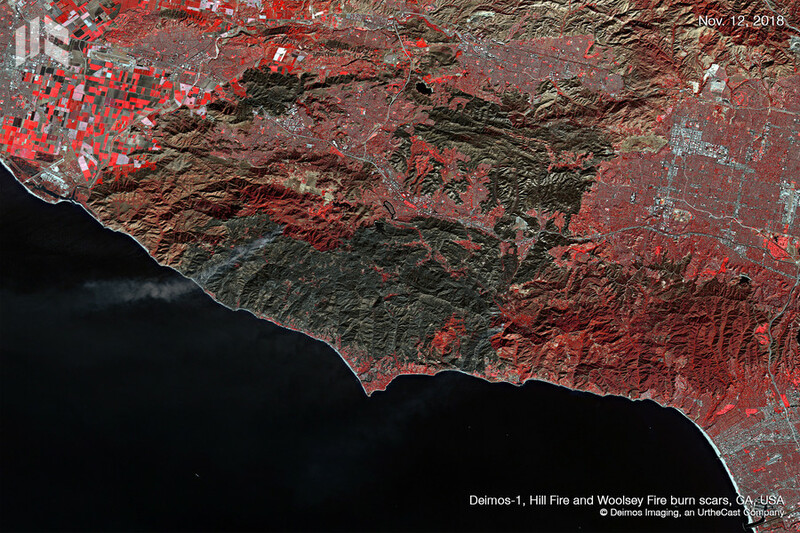 Deimos Imaging has shared jaw-dropping images of the destruction caused by the Hill Fire and the Woolsey Fire from November 12, with a staggering wall of flame extending across the rolling hills and obscuring the charred landscape downwind. 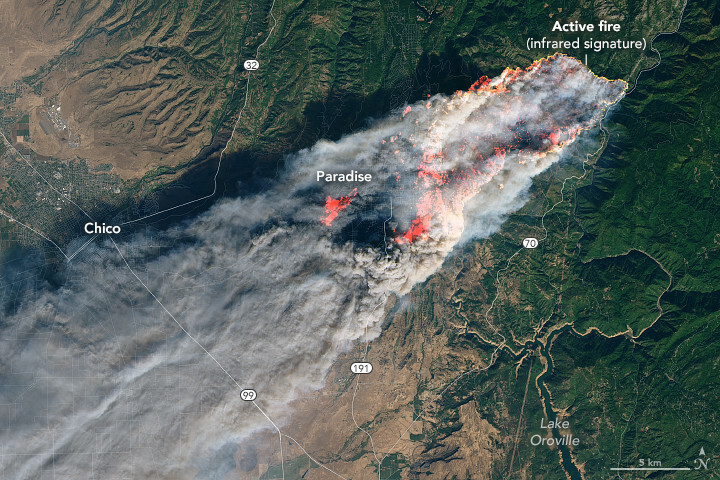 Previously, imagery captured on November 8 by NASA’s Landsat 8 satellite shows the Camp Fire in its infancy, just a few hours before it had seriously broken out. The fire would go on to consume 20,000 acres in less than 14 hours, at times growing by a football field every three seconds, owing to strong winds in the area. 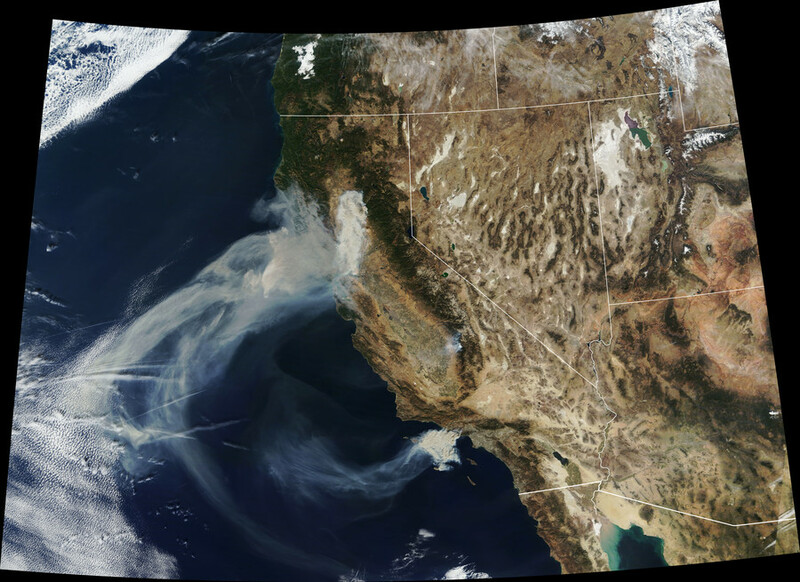 NASA’s Terra satellite captured a wider angle of the horrifying extent of the destruction on a statewide level, showing a vast plume of smoke extending malevolently into the southwestern US skies and drifting over the Pacific Ocean.